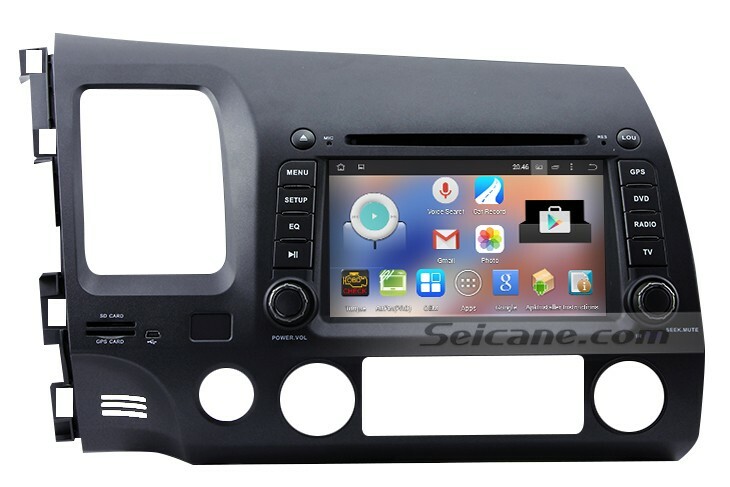 Look at the picture below, it’s an intelligent 2006-2011 Honda Civic car stereo from Seicane, which can support GPS navigation, DVD player, Bluetooth hands-free calls, Bluetooth music, FM/AM radio, RDS, USB, SD, etc. With a multifunctional car stereo in your car, you can enjoy a great deal of convenience and enjoyment while you are driving. You can easily get to your desired destination under the help of the turn-by-turn direction and voice prompts provided by the powerful GPS navigation system. You can also enjoy your favorite music on the way while the GPS is working due to its dual-zone function. The Bluetooth connection is desirable for you to sync your compatible mobile phone with this stereo to make hands-free calls and stream music to keep safe and pleasant. Listening to your favorite songs in the playlist of your iPod is available when you connect your iPod with it with an iPod cable. Other convenience is also easily accessible for you when you put this stereo into good use. If it’s the first time for you to use such a multi-functional stereo, you may be confused at how to use it. Here I’d like to tell you how to connect your mobile phone with this unit via Bluetooth technology. You may use the Bluetooth function in your mobile phone before. Actually, it’ s just the same to connect your mobile phone with this stereo as you connect a mobile phone with another phone. First of all, you need to open the Bluetooth function both in your mobile phone and head unit. Then you start to search the Bluetooth signal with either your mobile phone or the car stereo. When you find it, connect it. In this way, you can connect your mobile phone with the car stereo successfully. After connection, you can see your mobile phone information in Bluetooth interface where you can see your call history of your phone. You can also directly search the contact name and number on the big screen with the phonebook function. Besides, streaming music is also available via the Bluetooth connection. You can listen to the favorite songs in your mobile phone. Wish the above Bluetooth connection method can be helpful for you. There are many other functions which can provide other great convenience and pleasure for you. You can turn to the user manual for help if you have any questions on how to use them. Based on the Android 4.4.4 operation system and the RK3188 1.6 GHz Cortex A9 Quad-core CPU, this Honda Civic car stereo has an outstanding advantage on its smooth and fast performance. The latest 3D GPS system can provide lane assist, landmark display, intelligent route planning, 3D street view, millions of points of interest, turn-by-turn direction and voice prompts, making you possible to get to any location without getting lost. 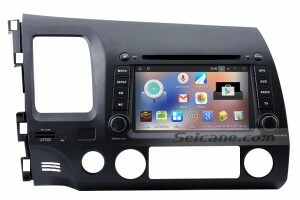 Wish you have a great time with this amazing Honda Civic car stereo. Good luck to you!